Will Smith is a charismatic actor, the rare kind that is never less than pleasant to watch and once in a while actually rewards our presence in the audience with a great performance. Because of this quality, he generates enormous goodwill in audiences even, or especially, when appearing in bad movies. Yes, we can think, he is a star but he seems so nice, too. 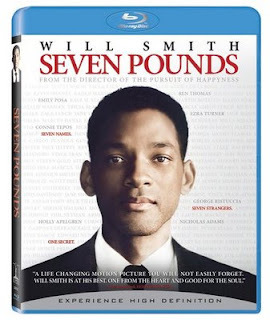 Casting Will Smith in Seven Pounds is a good move for it provides a reason for the audience to be patient. Cast an unknown and the audience would be walking out after the first jumbled quarter-hour. Smith plays Ben Thomas, an IRS agent who has a plan and proceeds to act on it in ways that make little sense, partially because of the jumbled chronology and partially because there’s a Big Secret to be revealed in the last act, which leads to strange scenes where more than one character knows the plan, are, in fact, talking about the plan, but say anything but the plan for no reason other than to preserve the eventual reveal. A blind man is harassed, a sick woman is stalked, an old woman is consoled, a battered woman is comforted, and a nursing home employee is assaulted. Why is this happening? It’s part of the plan. Don’t ask. Be patient. Oh, look! Will Smith! The most maddening thing about Seven Pounds is that it’s actually rather well made. It’s well shot with a slick gloss that keeps the oddness of the plot right below the surface and contains fine performances by Rosario Dawson and Woody Harrelson that find an emotional center amid the initially disconnected scenes. There’s one romantic scene that has a strange subtext because the Big Secret is beginning to take shape and the score picks up with a lush piano melody that sounds generic until a discordant note is struck, then another, as if the pianist were making little mistakes. The score (appropriated from Ennio Morricone's score from The Legend of 1900 at this moment) quite wonderfully picks at and echoes back the subtext of the scene. But after all that, director Gabriele Muccino seems to regard the central plan with a kind of honored awe so far beyond hero-worship it’s practically beatification, no, deification. The plan results in an act that is dubiously noble but raises intriguing questions that the movie promptly ignores on its way straight to ridiculous sentimentality. For all its serious intentions and ponderous mood, it ends up being little more than an excuse for one of the most ridiculously hammy death scenes I have ever seen. As played by a usually good actor, the death goes so far beyond reasonable it breaks the intention of the moment by lingering and dragging until I wondered why we’re seeing this poor character thrash about for so long. The movie wants to say how wonderful the death is, how altruistic. I, on the other hand, thought it was selfishly altruistic. Good comes out of it, but surely that’s not its only effect. The movie cheats when it comes to actually raising important themes rather than just pretending. I hate to see this nonsense get hidden under such nice trappings. Some will be moved by it but, as the great Pauline Kael once wrote (albeit not about this picture, of course), "what does it then mean if you're swept up by it? It doesn't necessarily mean that the picture that does it is art; it could just mean you've been softened." Or beaten into submission by this self-consciously artful pretension. Forget Monsters vs. Aliens, the real fight is Pixar vs. Dreamworks Animation. Pixar, long in the lead with their deft mix of masterpieces and mere excellence, has Dreamworks down for the count. Even though Kung Fu Panda and the first two Shreks are fun and Over the Hedge is not without its charms, the rest of their CG-feature output is pretty dismal. More often than not, Dreamworks seems to be trying too hard to satisfy all ages whereas Pixar makes it seem so easy. 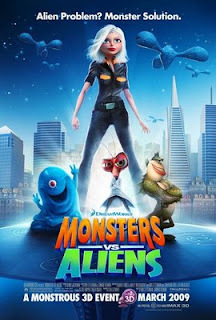 Monsters vs. Aliens does nothing to reverse Dreamworks's trend and I suppose it’s not all that surprising given their track record, but it’s always depressing to see a promising concept so thoroughly squandered. This is a hollow movie. There aren’t any great characters here despite the great ideas for characters. They stay designs up there on the screen, fun looking creatures with hip celebrity voices spouting cringingly obvious pop-culture references that are just enough out-of-date and out-of-place that they caused me to feel a little embarrassed for the filmmakers. “Dance Dance Revolution” and An Inconvenient Truth jokes? What is this, 2006? The story concerns monsters called into service by the president (Stephen Colbert, who unfortunately never rises above the obvious stunt-casting) and General W.R. Monger (Kiefer Sutherland) to fight an alien invasion. There’s one nice set piece in the middle of the movie involving a fight on the Golden Gate Bridge but, otherwise, the movie’s bafflingly slow in setting up the concept and remarkably uneventful after that. The concept isn’t all that complicated - the trailers, even the TV spots, set up the whole thing in seconds flat - but of the film’s two action sequences and the handful of funny moments, most have been cannibalized into the advertising. The movie takes forever to start, even longer to arrive and then spins its wheels once it gets there. This is anything but satisfying on a plot level but some of the voice work is very strong. Reese Witherspoon’s Susan, who becomes Ginormica, is a strong character, a great girl-power gust in an otherwise routine movie. Also memorable is Seth Rogen’s gooey Bob who’s an absolute goof, and a funny one. (Ginormica and Bob are much better than the material deserves. Can someone find a better movie for the two of them?) More disappointing are Will Arnett as a fish-man and Hugh Laurie as a cockroach-man. They’re funny actors but here they’re floundering with little to do and barely caricatures to play; they have vaguely focused traits but little else. And Rainn Wilson as Gallaxhar, the invading alien, is a curiously nonthreatening creature. As a result, the movie never seems to have any real stakes. Sure, the world might be destroyed, but if the movie doesn’t care why should I? The monsters are clearly 50s creature-feature throwbacks and there’s myriad references to various other, better, sci-fi movies like Close Encounters of the Third Kind and E.T. but the references are more than just winking at other movies, they’re reminders of how unsuccessful this movie is. It’s all commerce and little art for this enterprise which seems to have been tailor-made to sell cheap toys. During a scene near the end, while I should have been nervous that our heroes would fail, I was instead looking in the background at all the alien robots and wondering if that’s what the back room of a Toys 'R' Us looks like right now. Additional Note: The 3D looks just fine but doesn’t seem worth the fuss. For every scene where a paddleball of piece of debris flies out, there’s a scene during which I found myself wishing I could take the glasses off and just admire the very beautiful animation, the one flawless aspect of the movie. I would never have guessed that behind the bland ads and a blander poster, that Duplicity could actually be very good. I’m so happy that it’s more than very good: this is a smart, stylish, and witty movie that is a total frothy delight from beginning to end, the best froth I’ve seen in a while and the most satisfyingly twist-filled plot since, well, writer-director Tony Gilroy’s last movie (one of my favorites of 2007), Michael Clayton. 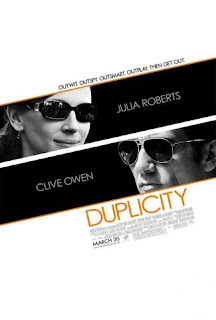 Duplicity is like that film in a major key, lighter, bouncier, sunnier, a comedy thriller about corporate espionage without a gun fight or car chase in sight. It’s an endlessly entertaining heist film (yes, that tired genre) as it continually backs up to fill us in on the con while moving forward to reveal how the con is more complicated than we think. The filmmakers delight in revealing their secrets to us, and I took delight in it as well, as the frame literally breaks apart and slides into the past then slowly shrinks back into the future to send us into even more twists. These are the kind of genuinely surprising twists that make me alternately gasp and chuckle, not the kind that appear simply because the gears of the plot require it of them. The dialogue spits and flips out of the actor’s mouths so effortlessly, so wittily, I’ll bet it could often work just as well as a radio play. But that would rob the film of its beautiful imagery, its fun split-screen moments, and the great visages of its stars. Julia Roberts’s face is harsher now than it once was but she’s settling into a more mature look, still a star up there, comfortable in her own skin, larger than life, and she’s having a blast. So is Clive Owen, pitch-perfect as always, but its startling after so many years of grim and grimmer stories to see him crack a smile. He’s having fun too. These are capital-S stars, the kind that help guide a smart, stylish movie to an even better place by their sheer luminosity. They play ex-spies, ex-maybe lovers, and maybe also examining the start of a beautiful friendship. They’re running a con game, and that’s all I should say. Are they running one con in tandem or two at once? Are they conning each other or just corporate America? What’s the difference between a hand cream and a lotion? Why does the last question matter (as it so obviously does)? I won’t say. There's too much fun to be had finding out. And then there’s a great supporting cast, the best of which is Paul Giamatti. Boy, it’s good to see him again, and in such a fun and funny role, twisting his face up in all-too-recognizable displays of corporate arrogance. Tom Wilkinson’s here too, in a mostly one-note role as an also recognizable corporate type: the self-satisfied windbag, although he gets a great monologue about ancient fire and also gets to explain one of the movie’s best twists. Together the two great men square off over the opening credits in an extremely slow-mo corporate fisticuffs that brings the house down. What a pure entertainment; it’s sleek and shiny, a beautiful pristine bliss machine. I loved every minute of it as it sizzles with a love of storytelling. And why shouldn’t it, when Gilroy has such a fun, satisfying story to tell. This is a classy and classical film that, with a few changes, – they’d have to be secretly married, their relations would be more implied, the tech much lower – could pass for a film of the forties or fifties, it’s so cleanly charming with effortless expert craftsmanship (who’d play the leads? I’m thinking Cary Grant and Rosalind Russell). A film that could have stepped wrong so often didn’t and by the end, when I realized Gilroy pulled it off, I was pleasantly surprised, no, pleasantly overjoyed. This is an effortlessly delightful movie, the best excuse for an ear-to-ear grin in these troubled times of pre-summer multiplex famine and economic drought. This is a roof-raising crowd-pleaser in the best sense. The kind of movie with generous humor and a complicated but comprehensible script that flies forward trusting the audience to keep pace. As Gilroy holds the last shot longer than expected (not unlike in Clayton) he allows the plot to settle in along with the full satisfaction of having seen a movie.